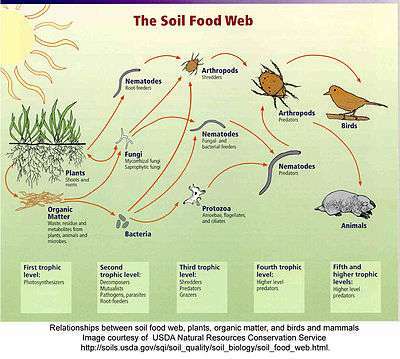 A food web (or food cycle) is the natural interconnection of food chains and a graphical representation (usually an image) of what-eats-what in an ecological community. Another name for food web is a consumer-resource system. Ecologists can broadly lump all life forms into one of two categories called trophic levels: 1) the autotrophs, and 2) the heterotrophs. To maintain their bodies, grow, develop, and to reproduce, autotrophs produce organic matter from inorganic substances, including both minerals and gases such as carbon dioxide. These chemical reactions require energy, which mainly comes from the sun and largely by photosynthesis, although a very small amount comes from hydrothermal vents and hot springs. A gradient exists between trophic levels running from complete autotrophs that obtain their sole source of carbon from the atmosphere, to mixotrophs (such as carnivorous plants) that are autotrophic organisms that partially obtain organic matter from sources other than the atmosphere, and complete heterotrophs that must feed to obtain organic matter. The linkages in a food web illustrate the feeding pathways, such as where heterotrophs obtain organic matter by feeding on autotrophs and other heterotrophs. The food web is a simplified illustration of the various methods of feeding that links an ecosystem into a unified system of exchange. There are different kinds of feeding relations that can be roughly divided into herbivory, carnivory, scavenging and parasitism. Some of the organic matter eaten by heterotrophs, such as sugars, provides energy. Autotrophs and heterotrophs come in all sizes, from microscopic to many tonnes - from cyanobacteria to giant redwoods, and from viruses and bdellovibrio to blue whales. Food webs are limited representations of real ecosystems as they necessarily aggregate many species into trophic species, which are functional groups of species that have the same predators and prey in a food web. Ecologists use these simplifications in quantitative (or mathematical) models of trophic or consumer-resource systems dynamics. Using these models they can measure and test for generalized patterns in the structure of real food web networks. Ecologists have identified non-random properties in the topographic structure of food webs. Published examples that are used in meta analysis are of variable quality with omissions. However, the number of empirical studies on community webs is on the rise and the mathematical treatment of food webs using network theory had identified patterns that are common to all. Scaling laws, for example, predict a relationship between the topology of food web predator-prey linkages and levels of species richness. The mass (or biomass) of something is equal to its energy content. Mass and energy are closely intertwined. However, concentration and quality of nutrients and energy is variable. Many plant fibers, for example, are indigestible to many herbivores leaving grazer community food webs more nutrient limited than detrital food webs where bacteria are able to access and release the nutrient and energy stores. "Organisms usually extract energy in the form of carbohydrates, lipids, and proteins. These polymers have a dual role as supplies of energy as well as building blocks; the part that functions as energy supply results in the production of nutrients (and carbon dioxide, water, and heat). Excretion of nutrients is, therefore, basic to metabolism. ":1230–1231 The units in energy flow webs are typically a measure mass or energy per m2 per unit time. Different consumers are going to have different metabolic assimilation efficiencies in their diets. Each trophic level transforms energy into biomass. 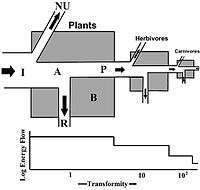 Energy flow diagrams illustrate the rates and efficiency of transfer from one trophic level into another and up through the hierarchy. There are different ways of calculating food chain length depending on what parameters of the food web dynamic are being considered: connectance, energy, or interaction. In its simplest form, the length of a chain is the number of links between a trophic consumer and the base of the web. The mean chain length of an entire web is the arithmetic average of the lengths of all chains in a food web. Ecological pyramids place the primary producers at the base. 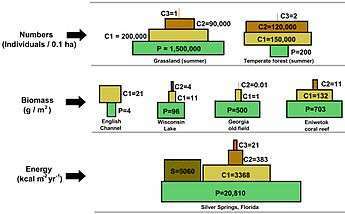 They can depict different numerical properties of ecosystems, including numbers of individuals per unit of area, biomass (g/m2), and energy (k cal m−2 yr−1). The emergent pyramidal arrangement of trophic levels with amounts of energy transfer decreasing as species become further removed from the source of production is one of several patterns that is repeated amongst the planets ecosystems. The size of each level in the pyramid generally represents biomass, which can be measured as the dry weight of an organism. Autotrophs may have the highest global proportion of biomass, but they are closely rivaled or surpassed by microbes. Within these categories, food webs can be further organized according to the different kinds of ecosystems being investigated. 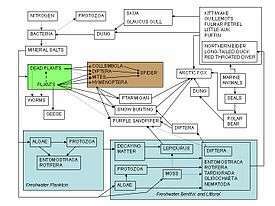 For example, human food webs, agricultural food webs, detrital food webs, marine food webs, aquatic food webs, soil food webs, Arctic (or polar) food webs, terrestrial food webs, and microbial food webs. These characterizations stem from the ecosystem concept, which assumes that the phenomena under investigation (interactions and feedback loops) are sufﬁcient to explain patterns within boundaries, such as the edge of a forest, an island, a shoreline, or some other pronounced physical characteristic. 1 2 Proulx, S. R.; Promislow, D. E. L.; Phillips, P. C. (2005). "Network thinking in ecology and evolution" (PDF). Trends in Ecology and Evolution. 20 (6): 345–353. doi:10.1016/j.tree.2005.04.004. PMID 16701391. 1 2 3 4 5 6 7 Pimm, S. L.; Lawton, J. H.; Cohen, J. E. (1991). "Food web patterns and their consequences" (PDF). Nature. 350 (6320): 669–674. doi:10.1038/350669a0. 1 2 3 4 5 6 7 Odum, E. P.; Barrett, G. W. (2005). Fundamentals of Ecology (5th ed.). Brooks/Cole, a part of Cengage Learning. ISBN 0-534-42066-4. 1 2 Benke, A. C. (2010). "Secondary production". Nature Education Knowledge. 1 (8): 5. ↑ Allesina, S.; Alonso, D.; Pascual, M. "A general model for food web structure." (PDF). Science. 320 (5876): 658–661. doi:10.1126/science.1156269. ↑ Azam, F.; Fenche, T.; Field, J. G.; Gra, J. S.; Meyer-Reil, L. A.; Thingstad, F. (1983). "The ecological role of water-column microbes in the sea" (PDF). Mar. Ecol. Prog. Ser. 10: 257–263. doi:10.3354/meps010257. ↑ Uroz, S.; Calvarus, C.; Turpault, M.; Frey-Klett, P. (2009). 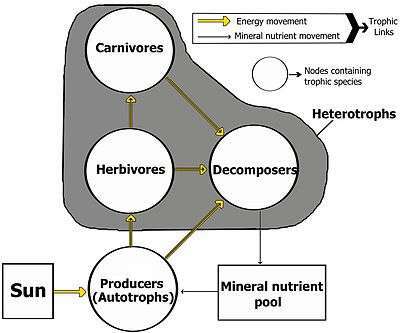 "Mineral weathering by bacteria: ecology, actors and mechanisms" (PDF). Trends in Microbiology. 17 (8): 378–387. doi:10.1016/j.tim.2009.05.004. PMID 19660952. ↑ Williams, R. J.; Martinez, N. D. (2000). "Simple rules yield complex food webs." (PDF). Nature. 404 (6774): 180–183. doi:10.1038/35004572. ↑ Post, D. M. (2002). "The long and short of food chain length" (PDF). Trends in Ecology and Evolution. 17 (6): 269–277. doi:10.1016/S0169-5347(02)02455-2. ↑ Tavares-Cromar, A. F.; Williams, D. D. (1996). "The importance of temporal resolution in food web analysis: Evidence from a detritus-based stream". Ecological Monographs. 66 (1): 91–113. doi:10.2307/2963482. 1 2 Pimm, S. L. (1979). "The structure of food webs" (PDF). Theoretical population biology. 16: 144–158. doi:10.1016/0040-5809(79)90010-8. PMID 538731. 1 2 Cousins, S. "Ecologists build pyramids again.". New Scientist. 1463: 50–54. ↑ McCann, K. (2007). "Protecting biostructure" (PDF). Nature. 446 (7131): 29. doi:10.1038/446029a. PMID 17330028. 1 2 Thompson, R. M.; Hemberg, M.; Starzomski, B. M.; Shurin, J. B. (March 2007). "Trophic levels and trophic tangles: The prevalence of omnivory in real food webs." (PDF). Ecology. 88: 612–617. doi:10.1890/05-1454. PMID 17503589. 1 2 3 Lindeman, R. L. (1942). "The trophic-dynamic aspect of ecology" (PDF). Ecology. 23 (4): 399–417. doi:10.2307/1930126. 1 2 Hairston, N. G.; Hairston, N. G. (1993). "Cause-effect relationships in energy flow, trophic structure, and interspecific interactions." (PDF). The American Naturalist. 142 (3): 379–411. doi:10.1086/285546. ↑ Fretwell, S. D. (1987). "Food chain dynamics: The central theory of ecology?" (PDF). Oikos. 50: 291–301. doi:10.2307/3565489. ↑ Polis, G. A.; Strong, D. R. (1996). "Food web complexity and community dynamics." (PDF). The American Naturalist. 147 (5): 813–846. doi:10.1086/285880. ↑ Hoekman, D. "Turning up the head: Temperature influences the relative importance of top-down and bottom-up effects." (PDF). Ecology. 91 (10): 2819–2825. doi:10.1890/10-0260.1. ↑ Schmitz, O. J. (2008). "Herbivory from individuals to ecosystems.". Annual Review of Ecology, Evolution, and Systematics. 39: 133–152. doi:10.1146/annurev.ecolsys.39.110707.173418. ↑ Tscharntke, T.; Hawkins, B., A., eds. (2002). Multitrophic Level Interactions. Cambridge: Cambridge University Press. p. 282. ISBN 0-521-79110-3. ↑ Polis, G.A. ; et al. (2000). "When is a trophic cascade a trophic cascade?" (PDF). Trends in Ecology and Evolution. 15 (11): 473–5. doi:10.1016/S0169-5347(00)01971-6. PMID 11050351. ↑ Sterner, R. W.; Small, G. E.; Hood, J. M. "The conservation of mass". Nature Education Knowledge. 2 (1): 11. ↑ Odum, H. T. (1988). "Self-organization, transformity, and information". Science. 242 (4882): 1132–1139. doi:10.1126/science.242.4882.1132. JSTOR 1702630. PMID 17799729. ↑ Odum, E. P. (1968). "Energy flow in ecosystems: A historical review". American Zoologist. 8 (1): 11–18. doi:10.1093/icb/8.1.11. ↑ Mann, K. H. (1988). "Production and use of detritus in various freshwater, estuarine, and coastal marine ecosystems" (PDF). Limnol. Oceanogr. 33 (2): 910–930. doi:10.4319/lo.1988.33.4_part_2.0910. 1 2 Koijman, S. A. L. M.; Andersen, T.; Koo, B. W. (2004). "Dynamic energy budget representations of stoichiometric constraints on population dynamics" (PDF). Ecology. 85 (5): 1230–1243. doi:10.1890/02-0250. ↑ Anderson, K. H.; Beyer, J. E.; Lundberg, P. (2009). "Trophic and individual efficiencies of size-structured communities". Proc Biol Sci. 276 (1654): 109–114. doi:10.1098/rspb.2008.0951. PMC 2614255 . PMID 18782750. ↑ Benke, A. C. (2011). "Secondary production, quantitative food webs, and trophic position". Nature Education Knowledge. 2 (2): 2. ↑ Spellman, Frank R. (2008). The Science of Water: Concepts and Applications. CRC Press. p. 165. ISBN 978-1-4200-5544-3. ↑ Kent, Michael (2000). Advanced Biology. Oxford University Press US. p. 511. ISBN 978-0-19-914195-1. ↑ Kent, Michael (2000). Advanced Biology. Oxford University Press US. p. 510. ISBN 978-0-19-914195-1. 1 2 Post, D. M. (1993). "The long and short of food-chain length". Trends in Ecology and Evolution. 17 (6): 269–277. doi:10.1016/S0169-5347(02)02455-2. 1 2 Worm, B.; Duffy, J.E. (2003). "Biodiversity, productivity and stability in real food webs". Trends in Ecology and Evolution. 18 (12): 628–632. doi:10.1016/j.tree.2003.09.003. 1 2 3 Paine, R. T. (1980). "Food webs: Linkage, interaction strength and community infrastructure.". Journal of Animal Ecology. 49 (3): 666–685. doi:10.2307/4220. JSTOR 4220. ↑ Raffaelli, D. (2002). "From Elton to mathematics and back again". Science. 296 (5570): 1035–1037. doi:10.1126/science.1072080. PMID 12004106. 1 2 3 Rickleffs, Robert, E. (1996). The Economy of Nature. University of Chicago Press. p. 678. ISBN 0-7167-3847-3. ↑ Whitman, W. B.; Coleman, D. C.; Wieb, W. J. (1998). "Prokaryotes: The unseen majority". Proc. Natl. Acad. Sci. USA. 95 (12): 6578–83. doi:10.1073/pnas.95.12.6578. PMC 33863 . PMID 9618454. ↑ Groombridge, B.; Jenkins, M. (2002). World Atlas of Biodiversity: Earth's Living Resources in the 21st Century. World Conservation Monitoring Centre, United Nations Environment Programme. ISBN 0-520-23668-8. ↑ Spellman, Frank R. (2008). The Science of Water: Concepts and Applications. CRC Press. p. 167. ISBN 978-1-4200-5544-3. ↑ Wang, H.; Morrison, W.; Singh, A.; Weiss, H. (2009). "Modeling inverted biomass pyramids and refuges in ecosystems" (PDF). Ecological Modelling. 220 (11): 1376–1382. doi:10.1016/j.ecolmodel.2009.03.005. ↑ Pomeroy, L. R. "The strategy of mineral cycling". Annual Review of Ecology and Systematics. 1: 171–190. doi:10.1146/annurev.es.01.110170.001131. JSTOR 2096770. ↑ Elser, J. J.; Fagan, W. F.; Donno, R. F.; Dobberfuhl, D. R.; Folarin, A.; Huberty, A.; et al. (2000). "Nutritional constraints in terrestrial and freshwater food webs" (PDF). Nature. 408 (6812): 578–580. doi:10.1038/35046058. ↑ Koch, P. L.; Fox-Dobbs, K.; Newsom, S. D. Diet, G. P.; Flessa, K. W., eds. The isotopic ecology of fossil vertebrates and conservation paleobiology. (PDF). The Paleontological Society Papers. 15. pp. 95–112. 1 2 Moore, J. C.; Berlow, E. L.; Coleman, D. C.; de Ruiter, P. C.; Dong, Q.; Hastings, A.; et al. (2004). "Detritus, trophic dynamics and biodiversity". Ecology Letters. 7 (7): 584–600. doi:10.1111/j.1461-0248.2004.00606.x. ↑ H. A., Lowenstam (1981). "Minerals formed by organisms.". Science. 211 (4487): 1126–1131. doi:10.1126/science.7008198. JSTOR 1685216. PMID 7008198. ↑ Warren, L. A.; Kauffman, M. E. (2003). "Microbial geoengineers". Science. 299 (5609): 1027–1029. doi:10.1126/science.1072076. JSTOR 3833546. PMID 12586932. ↑ González-Muñoz, M. T.; Rodriguez-Navarro, C.; Martínez-Ruiz, F.; Arias, J. M.; Merroun, M. L.; Rodriguez-Gallego, M. "Bacterial biomineralization: new insights from Myxococcus-induced mineral precipitation.". Geological Society, London, Special Publications. 336 (1): 31–50. doi:10.1144/SP336.3. ↑ Gonzalez-Acosta, B.; Bashan, Y.; Hernandez-Saavedra, N. Y.; Ascencio, F.; De la Cruz-Agüero, G. "Seasonal seawater temperature as the major determinant for populations of culturable bacteria in the sediments of an intact mangrove in an arid region." (PDF). FEMS Microbiology Ecology. 55 (2): 311–321. doi:10.1111/j.1574-6941.2005.00019.x. ↑ DeAngelis, D. L.; Mulholland, P. J.; Palumbo, A. V.; Steinman, A. D.; Huston, M. A.; Elwood, J. W. (1989). "Nutrient dynamics and food-web stability.". Annual Review of Ecology and Systematics. 20: 71–95. doi:10.1146/annurev.ecolsys.20.1.71. JSTOR 2097085. ↑ Twiss, M. R.; Campbell, P. G. C.; Auclair, J. (1996). "Regeneration, recycling, and trophic transfer of trace metals by microbial food-web organisms in the pelagic surface waters of Lake Erie." (PDF). Limnology and Oceanography. 41 (7): 1425–1437. doi:10.4319/lo.1996.41.7.1425. ↑ May, R. M. (1988). "How many species are there on Earth?" (PDF). Science. 241 (4872): 1441–1449. doi:10.1126/science.241.4872.1441. PMID 17790039. ↑ Beattie, A.; Ehrlich, P. (2010). "The missing link in biodiversity conservation.". Science. 328 (5976): 307–308. doi:10.1126/science.328.5976.307-c.
↑ Ehrlich, P. R.; Pringle, R. M. "Colloquium Paper: Where does biodiversity go from here? A grim business-as-usual forecast and a hopeful portfolio of partial solutions". Proceedings of the National Academy of Sciences. 105 (S1): 11579–11586. doi:10.1073/pnas.0801911105. PMC 2556413 . PMID 18695214. 1 2 Dunne, J. A.; Williams, R. J.; Martinez, N. D.; Wood, R. A.; Erwin, D. H.; Dobson, Andrew P. (2008). "Compilation and Network Analyses of Cambrian Food Webs.". PLOS Biology. 6 (4): e102. doi:10.1371/journal.pbio.0060102. 1 2 Krause, A. E.; Frank, K. A.; Mason, D. M.; Ulanowicz, R. E.; Taylor, W. W. (2003). "Compartments revealed in food-web structure" (PDF). Nature. 426 (6964): 282–285. doi:10.1038/nature02115. PMID 14628050. 1 2 Bormann, F. H.; Likens, G. E. (1967). "Nutrient cycling" (PDF). Science. 155 (3761): 424–429. doi:10.1126/science.155.3761.424. 1 2 Polis, G. A.; Anderson, W. B.; Hold, R. D. (1997). "Toward an integration of landscape and food web ecology: The dynamics of spatially subsidized food webs" (PDF). Annual Review of Ecology and Systematics. 28: 289–316. doi:10.1146/annurev.ecolsys.28.1.289. 1 2 O'Neil, R. V. (2001). "Is it time to bury the ecosystem concept? (With full military honors, of course!)" (PDF). Ecology. 82 (12): 3275–3284. doi:10.1890/0012-9658(2001)082[3275:IITTBT]2.0.CO;2. ↑ Gönenç, I. Ethem; Koutitonsky, Vladimir G.; Rashleigh, Brenda (2007). Assessment of the Fate and Effects of Toxic Agents on Water Resources. Springer. p. 279. ISBN 978-1-4020-5527-0. ↑ Gil Nonato C. Santos; Alfonso C. Danac; Jorge P. Ocampo (2003). E-Biology II. Rex Book Store. p. 58. ISBN 978-971-23-3563-1. ↑ Elser, J.; Hayakawa, K.; Urabe, J. (2001). "Nutrient Limitation Reduces Food Quality for Zooplankton: Daphnia Response to Seston Phosphorus Enrichment.". Ecology. 82 (3): 898–903. doi:10.1890/0012-9658(2001)082[0898:NLRFQF]2.0.CO;2. 1 2 Paine, R. T. "Road maps of interactions or grist for theoretical development?" (PDF). Ecology. 69 (6): 1648–1654. doi:10.2307/1941141. 1 2 3 Williams, R. J.; Berlow, E. L.; Dunne, J. A.; Barabási, A.; Martinez, N. D. (2002). "Two degrees of separation in complex food webs". Proceedings of the National Academy of Sciences. 99 (20): 12913–12916. doi:10.1073/pnas.192448799. ↑ Banasek-Richter, C.; Bersier, L. L.; Cattin, M.; Baltensperger, R.; Gabriel, J.; Merz, Y.; et al. "Complexity in quantitative food webs" (PDF). Ecology. 90 (6): 1470–1477. doi:10.1890/08-2207.1. ↑ Riede, J. O.; Rall, B. C.; Banasek-Richter, C.; Navarrete, S. A.; Wieters, E. A.; Emmerson, M. C.; et al. (2010). Woodwoard, G., ed. Scaling of food web properties with diversity and complexity across ecosystems. (PDF). 42. Burlington: Academic Press. pp. 139–170. ISBN 978-0-12-381363-3. ↑ Briand, F.; Cohen, J. E. (1987). "Environmental correlates of food chain length." (PDF). Science. 238 (4829): 956–960. doi:10.1126/science.3672136. 1 2 Neutel, A.; Heesterbeek, J. A. P.; de Ruiter, P. D. (2002). "Stability in real food webs: Weak link in long loops" (PDF). Science. 295 (550): 1120–1123. doi:10.1126/science.1068326. ↑ Leveque, C., ed. (2003). 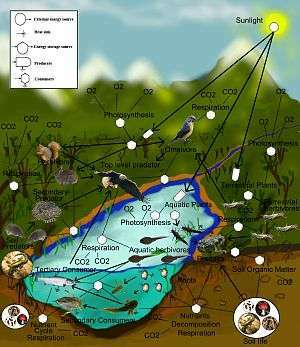 Ecology: From ecosystem to biosphere. Science Publishers. p. 490. ISBN 978-1-57808-294-0. 1 2 Proctor, J. D.; Larson, B. M. H. (2005). "Ecology, complexity, and metaphor" (PDF). BioScience. 55 (12): 1065–1068. doi:10.1641/0006-3568(2005)055[1065:ECAM]2.0.CO;2. 1 2 Dunne, J. A.; Williams, R. J.; Martinez, N. D. (2002). "Food-web structure and network theory: The role of connectance and size". Proceedings of the National Academy of Sciences. 99 (20): 12917–12922. doi:10.1073/pnas.192407699. ↑ Banašek-Richter, C.; Bersier, L.; Cattin, M.; Baltensperger, R.; Gabriel, J.; Merz, J.; et al. (2009). "Complexity in quantitative food webs" (PDF). Ecology. 90: 1470–1477. doi:10.1890/08-2207.1. 1 2 Capra, F. (2007). "Complexity and life". Syst. Res. 24: 475–479. doi:10.1002/sres.848. ↑ Peters, R. H. (1988). "Some general problems for ecology illustrated by food web theory". Ecology. 69 (6): 1673–1676. doi:10.2307/1941145. JSTOR 1941145. ↑ Michener, W. K.; Baerwald, T. J.; Firth, P.; Palmer, M. A.; Rosenberger, J. L.; Sandlin, E. A.; Zimmerman, H. (2001). "Defining and unraveling biocomplexity" (PDF). BioScience. 51: 1018–1023. doi:10.1641/0006-3568(2001)051[1018:daub]2.0.co;2. ↑ Bascompte, J.; Jordan, P. (2007). "Plant-animal mutualistic networks: The architecture of biodiversity." (PDF). Annu. Rev. Ecol. Evol. Syst. 38: 567–569. doi:10.1146/annurev.ecolsys.38.091206.095818. ↑ Montoya, J. M.; Pimm, S. L.; Solé, R. V. (2006). "Ecological networks and their fragility" (PDF). Nature. 442 (7100): 259–264. doi:10.1038/nature04927. ↑ Michio, K.; Kato, S.; Sakato, Y. (2010). "Food webs are built up with nested subwebs". Ecology. 91: 3123–3130. doi:10.1890/09-2219.1. ↑ Montoya, J. M.; Solé, R. V. (2002). "Small world patterns in food webs" (PDF). Journal of Theoretical Biology. 214 (3): 405–412. doi:10.1006/jtbi.2001.2460. ↑ Montoya, J. M.; Blüthgen, N; Brown, L.; Dormann, C. F.; Edwards, F.; Figueroa, D.; et al. (2009). "Ecological networks: beyond food webs" (PDF). Journal of Animal Ecology. 78: 253–269. doi:10.1111/j.1365-2656.2008.01460.x. ↑ Shurin, J. B.; Gruner, D. S.; Hillebrand, H. (2006). "All wet or dried up? Real differences between aquatic and terrestrial food webs" (PDF). Proc. R. Soc. B. 273 (1582): 1–9. doi:10.1098/rspb.2005.3377. PMC 1560001 . PMID 16519227. ↑ Egerton, F. N. "A history of the ecological sciences, part 6: Arabic language science: Origins and zoological writings." (PDF). Bulletin of the Ecological Society of America. 83 (2): 142–146. ↑ Egerton, FN (2007). "Understanding food chains and food webs, 1700-1970". Bulletin of the Ecological Society of America. 88: 50–69. doi:10.1890/0012-9623(2007)88[50:UFCAFW]2.0.CO;2. ↑ Shelford, V. (1913). "Animal Communities in Temperate America as Illustrated in the Chicago Region". University of Chicago Press. ↑ Summerhayes, VS; Elton, CS (1923). "Contributions to the Ecology of Spitsbergen and Bear Island". Journal of Ecology. 11: 214–286. doi:10.2307/2255864. ↑ Hardy, AC (1924). "The herring in relation to its animate environment. Part 1. The food and feeding habits of the herring with special reference to the east coast of England". Fisheries Investigation London Series II. 7 (3): 1–53. 1 2 Elton, C. S. (1927). Animal Ecology. London, UK. : Sidgwick and Jackson. ISBN 0-226-20639-4. ↑ Elton CS (1927) Animal Ecology. Republished 2001. University of Chicago Press. ↑ Stauffer, R. C. (1960). "Ecology in the long manuscript version of Darwin's "Origin of Species" and Linnaeus' "Oeconomy of Nature"". Proc. Am. Philos. Soc. 104 (2): 235–241. JSTOR 985662. ↑ Worster, D. (1994). Nature's economy: A history of ecological ideas (2nd ed.). Cambridge University Press. p. 423. ISBN 978-0-521-46834-3. ↑ Paine, RT (1966). "Food web complexity and species diversity". The American Naturalist. 100: 65–75. doi:10.1086/282400. ↑ May RM (1973) Stability and Complexity in Model Ecosystems. Princeton University Press. ↑ Pimm SL (1982) Food Webs, Chapman & Hall.